Box of Stolen Socks: "Sea of Poppies"
I don't know if it happens to you, but sometimes I buy a book and let it rest on my bookshelf for years. I look at it but don't dare read it, as if I knew that when I start there will be no going back. I would be swept away by the narrative and the characters to an alternate reality, a universe where I'd be controlled by them. 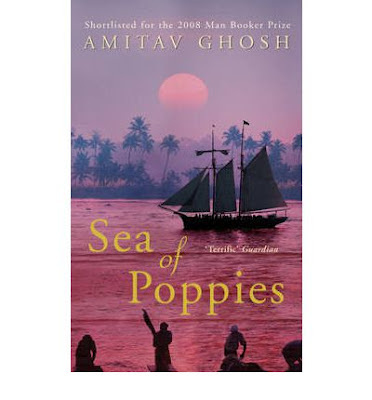 This is exactly what happened with the "Sea of Poppies" by Amitav Ghosh. For days now I've been moving back and forth between the mundane present and enchanting world created by Ghosh's ability to create fascinating art with words. This book is an epic tale of tales, set in India at the hight of the Opium trade. Undoubtedly, the writer has a special ability. His brain is the hutching ground for hundreds of stories, short and long, with detailed scenarios and elaborate characters. You can easily lose track of reality following the threads of his story weaving. His real gift, though, is that this creative abundance does not overwhelm the reader. Instead, his is left hungry for more and in a desperate need to continue his voyage in the magical places Gosh introduced him to. There are so many levels to this book. There are, of course, stories of forbidden love and tearful separations, but it also touches upon serious issues relevant both in the past and in the present. Slavery and economic exploitation, as the peasants were forced by the opium traders to plant poppies instead of crops to feed their families. Inevitably they were always bound by debt to the Opium Factory, which in turn, led to their disguised enslavement as coolies sent to work in the plantations of other colonies. The partiality of the justice system towards the local populations in favour of the colonial rulers. The rigidity of local traditions and the intricacies of caste and social standing. It sounds heavy but believe me it is not. And this is what I love about Gosh's writing. He has a way of conveying his criticism indirectly, leaving the reader decide if his writing is actually supposed to be critical of the exploitation and damage done by the colonial rulers or just a very cynical way of describing a particular event. While reading I couldn't help but draw parallels between the inhuman conditions the coolies experienced while transported on the ship two hundred years ago to the modern day economic immigrants who leave this region to work in the rich lands of sand and oil dollars, only to realise that they too are slaves. Maybe the time I spent in Saudi Arabia, witnessing the brutal living conditions this lowest of the low caste of "ex-pats" had to endure, really influenced my judgement. Overall, "Sea of Poppies" is a true masterpiece and it is definitely worth your time to read it. Some might think that the plot moves slowly. It is true to some extent, but bare in mind that in Gosh's story hutching-pond of a brain, this first book is just the beginning of a trilogy. Once you get past the first 50 or so pages and familiarise yourself with the tongue twisting amalgam of Indian dialects, pigeon English and French words, you can see the story progressing together with the characters. Their changes and transformations are truly powerful, inspiring and sometimes quite unexpected.